Footgolf; not your average work social! Looking for something a little bit different to shake up your next office social or team building day? Footgolf has taken the UK by storm over the last couple of years, and combines two of the country’s most popular sports into one fun game – the best part is anyone, of any age, can play! Similar to golf, the aim of the game is to get your football into a large hole in the least kicks as possible, whilst avoiding various obstacles along the way. 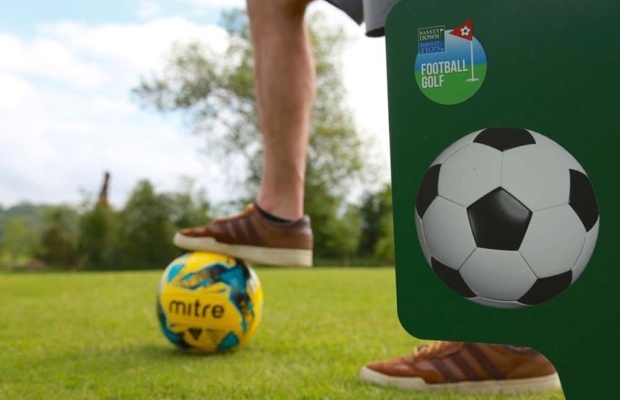 Basset Down Golf Complex, just a few minute’s drive from J16 (M4) has two footgolf courses for your team to choose from; a 9 hole ‘crazy footgolf course’ themed on local landmarks (it’s the only one like it in the country! ), and an 18 hole course for those who fancy more of a challenge. Surrounded by the Wiltshire countryside, each course is perfect for corporate events, team building days or staff socials, and an ideal way to get all the group involved. Packages are available throughout the week, for groups of 8 or more people. There’s also the option of having home cooked food and drinks to enjoy after your game in their marquees. www.bassetdowngolfcourse.com or email info@bassetdowngolfcourse.com for a personalised quote.